A few years ago, Stephen Flowers of Milton hit pay dirt while competing in the SkillsUSA Region 1 competition. Not only did the Locklin Technical Center student placed second in the HVACR category at 2012 competition but he also received a job offer. That good fortune may revisit some of the more than 300 high school and college students from Pensacola to Tallahassee set to compete in this year’s Region 1 Competition set for Feb. 28-March 1. Hosted by Pensacola State College, the competition events are held in conjunction with the seventh annual Worlds of Possibilities Career Expo at the PSC Lou Ross Center, Building 3, on the Pensacola campus. SkillsUSA competitions are based on leadership, service and technical fields ranging from cybersecurity to health occupations to HVACR. “As SkillsUSA competitors, my classmates and I knew we had to bring our best to the table. Competing in the organization really helped me improved my skill set and gave me something to work toward,” Flowers remembered. “I knew I would be going against the best of the best in Northwest Florida so I really worked hard to make sure I was up to the task. It really paid off for me in a big way. 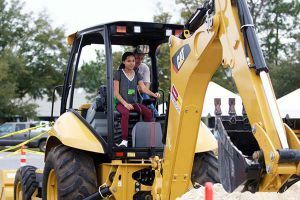 Along with the SkillsUSA competition, the college also will host about 2,500 fourth- through eighth-grade students – as well as high school students – from Escambia and Santa Rosa counties who will visit the Worlds of Possibilities Career Expo. Local businesses and vendors provide hands-on activities for students to experience various careers. Two new career worlds this year focus on aviation and hospitality. Courtesy of Ferguson Airport, the World of Aviation features an R-44 helicopter and pilots on site to talk with students about careers and opportunities in aviation. Highpointe Hotel Corporation presents the World of Hospitality featuring table etiquette activities. In other Expo activities, Jaeger Corporation features an Amatrol Electrical Trainer, 3 D Printer and Bio Medical Technology. The World of Construction shows off the energy-efficient tiny house built by PSC students. Sure to attract attention from students and adult visitors is the U.S. Navy display that includes a large array of military equipment such as a SideWinder missile, aircraft fuel cell cut-away, flight instruments, aircraft carrier catch wire 4-foot section, aircraft tail hook, F-14 jet engine turbine blade, jet engine combustion chamber canister, jet engine igniter and much more. The public is invited to tour the Worlds of Possibilities Expo from 1-2:30 p.m. Tuesday, Feb. 28. “The SkillsUSA competitions and Worlds of Opportunities Expo are effective ways to engage students and prompt them to consider a variety of career choices. These activities often open doors to future careers for these young people,” said Jennifer Ponson, PSC coordinator of student and program outreach. Platinum sponsor for the event is Gulf Power Company. Gold sponsors are Florida West, Northwest Florida Manufacturers Council, Aerotek, and Navy Federal Credit Union. Silver sponsors are Central Gulf Industrial Alliance, EREC / Power South Energy Cooperative, Home Builders Association of West Florida, Pensacola Energy, East Hill Building and Design, Ferguson Airport, Highpointe Hotel Corporation, and Technical Training Aids. Bronze sponsors: AppRiver, Baptist Health Care, CES Team One Communications, CareerSafe, D.C. Jaeger, Escambia County School District Workforce Education, Fellows Foundation, George Stone Technical Center, International Brotherhood of Electrical Workers, Locklin Technical Center, U.S. Navy, Santa Rosa County School District Workforce Education, University of West Florida, and West Florida AHEC. For details, contact Jennifer Ponson at 850-484-2245 or jponson@pensacolastate.edu.